DIE Jovis, 18 die Novembris. Letters from the King, and Colonel Hammond. Order against Listening at the Doors. Complaint against Cawdrey, Proctor of Cam. Univ. Letter from the Scots Commissioners. 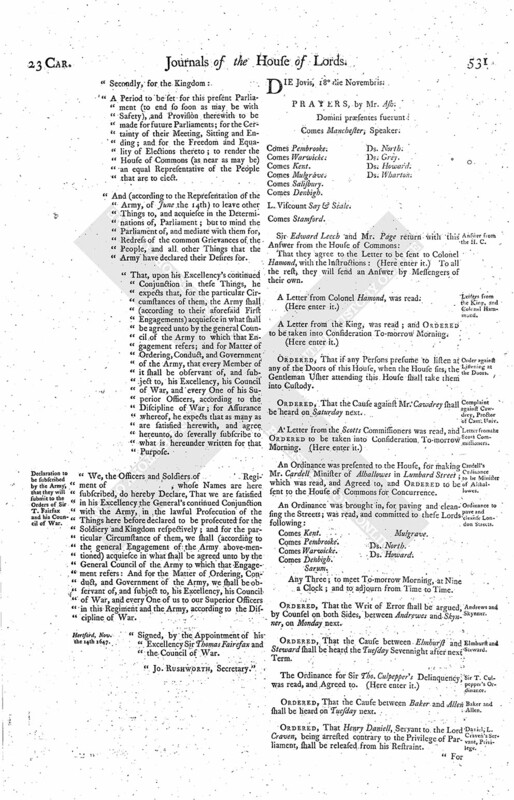 Cardell's Ordinance to be Minister of Allhallowes. Ordinance to pave and cleanse London Streets. Daniel, L. Craven's Servant, Privilege. Letter from the Scots Commissioners, complaining of receiving no Answers to their Letters, of the Shortness of Time allowed them to consider of the Propositions, and of the Usage the King has lately met with; and pressing their former Desire of His coming to London, for a Personal Treaty. Ordinance to clear Sir T. Culpepper of his Delinquency. Letter from Colonel Hammond, that he has ordered, no Persons shall come in or go outof the Isle of Wight without his Pass;—and desiring the King's former Allowance may be continued to Him. That they agree to the Letter to be sent to Colonel Hamond, with the Instructions: (Here enter it.) To all the rest, they will send an Answer by Messengers of their own. A Letter from the King, was read; and Ordered to be taken into Consideration To-morrow Morning. Ordered, That if any Persons presume to listen at any of the Doors of this House, when the House sits, the Gentleman Usher attending this House shall take them into Custody. Ordered, That the Cause against Mr. Cawdrey shall be heard on Saturday next. 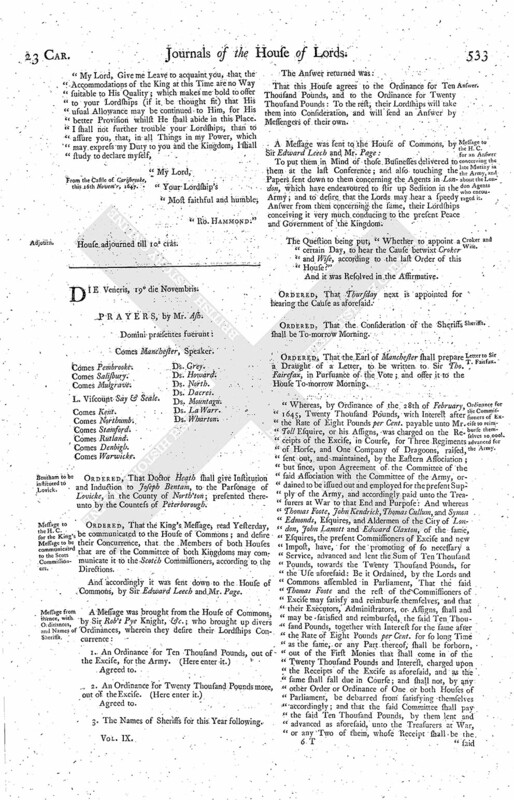 An Ordinance was presented to the House, for making Mr. Cardell Minister of Alhallowes in Lumbard Street; which was read, and Agreed to, and Ordered to be sent to the House of Commons for Concurrence. Any Three; to meet To-morrow Morning, at Nine a Clock; and to adjourn from Time to Time. Ordered, That the Writ of Error shall be argued, by Counsel on both Sides, between Andrewes and Skynner, on Monday next. Ordered, That the Cause between Elmhurst and Steward shall be heard the Tuesday Sevennight after next Term. Ordered, That the Cause between Baker and Allen shall be heard on Tuesday next. Ordered, That Henry Daniell, Servant to the Lord Craven, being arrested contrary to the Privilege of Parliament, shall be released from his Restraint. "For the Right Honnorable the Speaker of the House of Peeres pro Tempore. "Wee are very sorry that Occasion is soe often given us to complaine, that wee receive noe Answere to the Papers delivered in by us to the Honnorable Houses; and that, in all Desires made unto us, even in Matters of common Interest and greatest Consequence, a short Tyme is lymitted and peremptorily prescribed unto us: And wee doe earnestly desire the Houses to consider, that it is not according to the Custome which hath bin formerly observed, nor is it the Way to continue a good Understanding betwixt the Kingdomes. "Upon the 5th of this Instant, we wrote a Letter to both Houses, to which wee againe desired an Answere upon the 11th, when the Propositions were communicated unto us; but wee have yet received noe Answere at all: And heareing, upon the 12th, that His Majesty was gone from Hampton Court, wee did then desire to understand from the Honnorable Houses the Certainty thereof, conceiveing it very improper for us to take into Consideration the sending of Propositions to His Majesty, untill wee knew the Certainty of His Departure from Hampton Court, and whether He was gone: Yesternight late, and noe sooner, wee received the Coppy of a Letter from His Majesty, dated at Hampton Court, the 11th of this Instant, and directed to "The Speaker of the House of Peeres, to be comunicated to the Lords and Commons in the Parliament of England, and the Commissioners of the Parliament of Scotland, &c." But noe Intimation was made unto us, whether His Majesty is gone, in what Condition He is, or how any Addresse may be made unto Him; all which are most necessary to be made knowne unto us, before wee can say any Thing of Propositions to be sent to the King: Yet neverthelesse, by Order from both Houses, it is signifyed to us, That they have resolved to send Propositions upon Monday next to His Majesty, without alloweing us any competent Tyme to consider of the same; though (as upon the short View that wee have taken wee doeperceive) there be very many and greate Alterations and Omissions of, and Additions to, the former Propositions agreed on by both Kingdomes, and those Alterations principally in Matters of joynt Interest. Worcest. House, the 17th November, 1647. 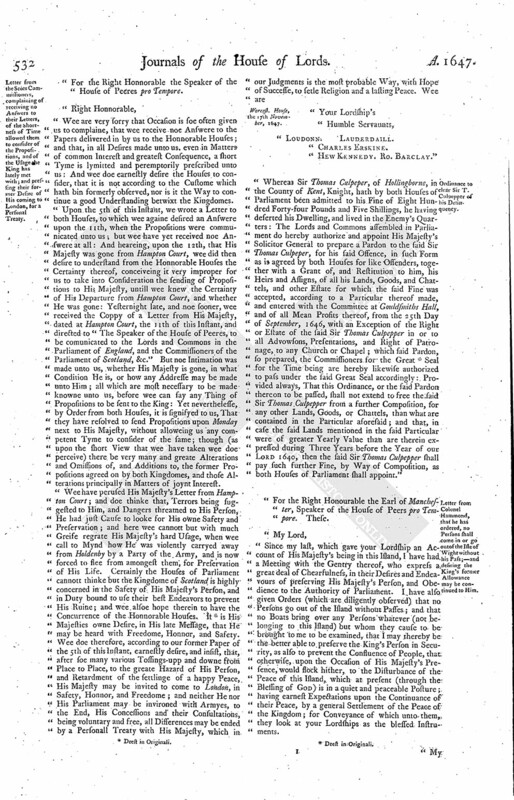 "Whereas Sir Thomas Culpeper, of Hollingborne, in the County of Kent, Knight, hath by both Houses of Parliament been admitted to his Fine of Eight Hundred Forty-four Pounds and Five Shillings, he having deserted his Dwelling, and lived in the Enemy's Quarters: The Lords and Commons assembled in Parliament do hereby authorize and appoint His Majesty's Solicitor General to prepare a Pardon to the said Sir Thomas Culpeper, for his said Offence, in such Form as is agreed by both Houses for like Offenders, together with a Grant of, and Restitution to him, his Heirs and Assigns, of all his Lands, Goods, and Chattels, and other Estate for which the said Fine was accepted, according to a Particular thereof made, and entered with the Committee at Gouldsmiths Hall, and of all Mean Profits thereof, from the 25th Day of September, 1646, with an Exception of the Right or Estate of the said Sir Thomas Culpepper in or to all Advowsons, Presentations, and Right of Patronage, to any Church or Chapel; which said Pardon, so prepared, the Commissioners for the Great (fn. 2) Seal for the Time being are hereby likewise authorized to pass under the said Great Seal accordingly: Provided always, That this Ordinance, or the said Pardon thereon to be passed, shall not extend to free the said Sir Thomas Culpepper from a further Composition, for any other Lands, Goods, or Chattels, than what are contained in the Particular aforesaid; and that, in case the said Lands mentioned in the said Particular were of greater Yearly Value than are therein expressed during Three Years before the Year of our Lord 1640, then the said Sir Thomas Culpepper shall pay such further Fine, by Way of Composition, as both Houses of Parliament shall appoint." "Since my last, which gave your Lordship an Account of His Majesty's being in this Island, I have had a Meeting with the Gentry thereof, who express a great deal of Chearfulness, in their Desires and Endeavours of preserving His Majesty's Person, and Obedience to the Authority of Parliament. I have also given Orders (which are diligently observed) that no Persons go out of the Island without Passes; and that no Boats bring over any Persons whatever (not belonging to this Island) but whom they cause to be brought to me to be examined, that I may thereby be the better able to preserve the King's Person in Security, as also to prevent the Confluence of People, that otherwise, upon the Occasion of His Majesty's Presence, would flock hither, to the Disturbance of the Peace of this Island, which at present (through the Blessing of God) is in a quiet and peaceable Posture; having earnest Expectations upon the Continuance of their Peace, by a general Settlement of the Peace of the Kingdom; for Conveyance of which unto them, they look at your Lordships as the blessed Instruments. From the Castle of Carisbrooke, this 16th Novem'r, 1647.